Lineup – Marc Copland: piano; Ralph Alessi: trumpet; Drew Gress: bass; Joey Baron: drums. 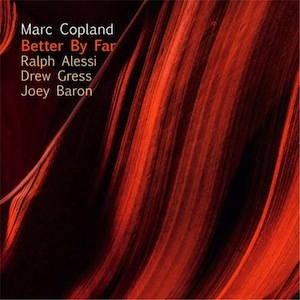 Marc Copland is a tremendous jazz pianist with a special ability to create stunning atmospheres with unrugged textures. Having collaborated in the recent years with the virtuous bassist Gary Peacock (Now This; Tangents) and the late guitarist John Abercrombie (39 Steps; Up and Coming), Copland never turned his back to his personal projects, which usually overflow with melodic sensibility and strong rhythmic discernment. The compositions included in Better By Far, his newest work, were skilfully penned to be performed by the same enlightened quartet that delivered the 2015 album Zenith, which deserved every accolade received. The top artists - trumpeter Ralph Alessi, bassist Drew Gress, and drummer Joey Baron, are experienced musicians who move effortlessly within the modern jazz environment. The first couple of tunes, “Day and Night” and “Better By Far”, evoke the lyricism of Kenny Wheeler, acclaimed trumpeter with whom he joined in a trio that also included Abercrombie. Sometimes subtlety swinging, sometimes suspended in Gress’ loose rambles and Baron’s classy drumming, both tunes embrace a captivating erudition. The quartet conjures up feathery sonic layers of scintillating beauty, whether they’re forging a disentangled, circumspect waltz such as “Gone Now”, or elegantly depicting grey landscapes smothered by sinister clouds like in “Dark Passage”. There’s plenty of adventure throughout “Mr. DJ”, in which a daring rhythm invites to free improvisation. Here, we can hear Copland responding to Alessi’s poignant melodies through chordal sequences full of rhythmic intention. Also “Twister”, despite the ruminative and static posture evinced, follows a groovy conduct that encourages the musicians to opt for straightforward actions. Proving that the art of swinging is fabulous and immortal, the quartet enters in that special mode when handling Monk’s “Evidence” and also “Who Said Swing?”, a playful tune in which Baron fires up a few instinct yet controlled rhythmic spasms. Even actuating within patented structures and forms, Copland is all freedom and sophistication, preferring a beautiful time feel to complicated, showy maneuvers. Indeed, Better By Far is by far, one of his best records.